You may want Angelic wedding to manage every aspect of your wedding wether it is flower and decor, however you decide, we will assist in all your needs. You can be assured that Angelic will take a load of your shoulder leaving you to enjoy this special day. To become the prime Décor and Hiring services company, setting standards for the industry. You will be assured of our total commitment, ensuring your special event is memorable with a lasting impression. 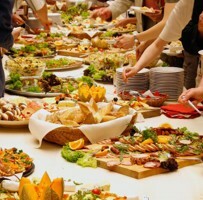 Angelic Catering and décor services provider located in Vanderbijlpark, Vaal Triangle. Angelic Catering and décor services believe that each function and event should by arranged with great style and elegance, but without the huge price tag which would generally come along with this. Angelic Weddings Creations is a décor and catering services company that has been successful in offering what their clients have been searching for in affordable décor and catering services in the Vaal Triangle, Vereeniging, Sasolburg, Meyerton .